There are more than 70 wineries located in the Finger Lakes Region, making wine tours a popular visitor activity. Spend an incredible afternoon touring the wineries and trails that hug the shorelines of Cayuga, Seneca, Canandaigua and Keuka Lakes and enjoy some of the best wine in the world while taking in the breathtaking scenery and country side. Operated by the National Park Service, the Park preserves the sites associated with the 1848 First Women’s Rights Convention. Immerse yourself in the lives of great American women while viewing artifacts and special exhibits. Learn more about the Hall’s Inductees at our research center, home to a library and archival materials. Join us every other Fall as we celebrate the achievements of new Inductees during our Induction Weekend..
Our historic community is blessed with a beautiful waterfront with docking facilities for boaters that travel the Cayuga-Seneca Canal. Our new boater facility provides some very important amenities for travelers. We have converted the lower level of a three story building that will provide bathrooms, showers and laundry accommodations. We provide a harbor master during the summer months to welcome visitors and provide directions to our local attractions. Seneca Falls is widely believed to be the inspiration for Frank Capra’s holiday classic, “It’s A Wonderful Life”. Come to Seneca Falls and visit the village and locations that inspired Mr. Capra in his visits to Seneca Falls in the early 1900’s. Stand on the bridge that Jimmy Stewart’s character leaped from in the movie. Visit in December to take part in the weekend festivals that celebrate our connection to the holiday classic. The Seneca Falls Heritage Area interprets the village’s development and role in the Reform Movements of the 19th century, focusing on the setting for the first Women’s Rights Convention in 1848. 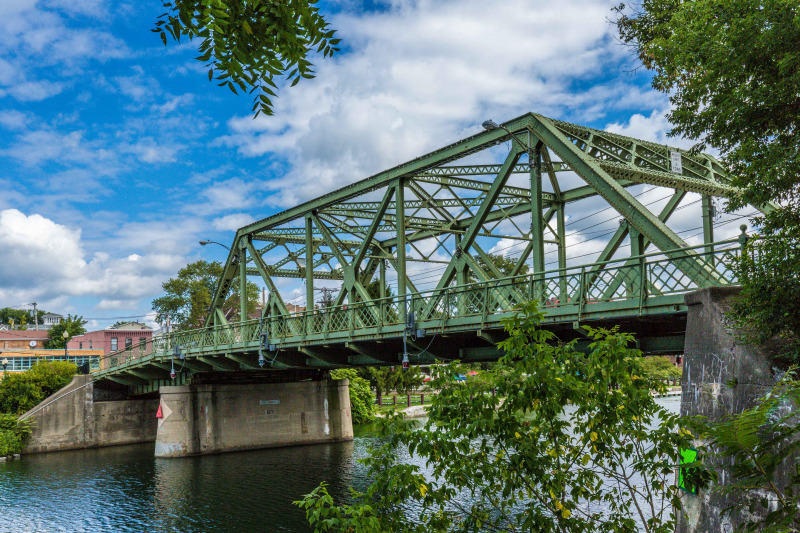 The Heritage Area features a classic main street, a well-appointed harbor on the Cayuga-Seneca Canal, and many historic homes and architecturally interesting neighborhoods. The Heritage Area’s Visitor Center serves as an orientation point for local and regional history, providing an historical overview and information on various area attractions. Cayuga Lake State Park’s terrain is flat at lakeshore, where the beach and sun lawns are, then slopes gently uphill to campsites and cabins. The scenic highlight of the park is its expansive view of Cayuga Lake. In the shallow water near the park, largemouth bass, bullheads and carp thrive. In deeper water, anglers can catch northern pike, small mouth bass, lake trout, landlocked salmon and many other varieties of fish. The park has a boat launch, playground, playing field and recreation building. The development of the Cay-Sen canal trail has been under consideration and planning for over five years. When it is completed, it will run from the lakefront in Geneva to Waterloo, Seneca Falls and then to the Montezuma Wildlife Refuge. The majority of the trail will be off road, following the Cayuga/Seneca River. At the present time, people may use the trail that travels along the lakefront in Geneva through Seneca Lake State Park. Also there is a section of trail called the Ludivico Heritage Trail that is available in Seneca Falls that follows the canal. Connecting the Erie Canal with upstate New York’s Finger Lakes Region, the Cayuga-Seneca Canal is 12 miles long and combines the unique experience of inland water and deep-lake cruising. Whether by boat, or by car, the Cayuga-Seneca Canal provides the perfect link into New York’s premier wine region. The Seneca Museum celebrates historic Seneca Falls, Seneca County, and the Finger Lakes region of central New York State. The Museum illustrates how the Seneca River and the Cayuga-Seneca Canal powered the rise of industry and fostered cultural development, helping to spread social reform movements. If you like the great outdoors, you’ll love our hiking trails. The Seneca Meadows Wetlands Preserve features over seven miles of breath taking trails through forested land, lush prairies and along serene ponds. Wildlife can be seen in abundance on these paths, and lookout stations help you catch a better view of their activities and antics. Guided tours of 1880 Queen Anne mansion offer a glimpse into the lifestyles of Seneca Falls’ industrialists. The one-mile trail extends along the south side of the Cayuga-Seneca Canal from the Village of Seneca Falls west to Sucker Brook. The Trail’s Visitors and Arts Center is located at 61 Ovid Street, Route 414 in Seneca Falls. Trinity Church was built in 1885 in the Anglo-Gothic style. It is famous for its rising tower and stained glass, some of which were made by the Louis Tiffany Studios. The church is located at 27 Fall Street along the western end of Van Cleef Lake. For more information contact 315-568-5145. Join us every July to celebrate the original Women’s Right Convention held in Seneca Falls on July 13, 1848. Food, music and history come alive in Seneca Falls for this annual celebration. The Convention Days Committee’s goal is to celebrate the original Convention and to bring to light the ongoing struggle for equality among all people regardless of their education, religion, ethnic background, age, income, or gender. Montezuma Refuge serves as a major resting area for waterfowl and other waterbirds on their journeys to and from nesting areas in northeastern and east-central Canada. Site of the first women’s rights cconvention in 1848. Adjacent visitor center houses exhibits on the history of women’s rights; part of Women’s Rights National Historical Park, operated by the National Park Service. Home of the women’s rights leader, Elizabeth Cady Stanton. Open for guided tours by National Park Service rangers.